RIA-E100’s battery is custom made according to requirements of robot power consumption. 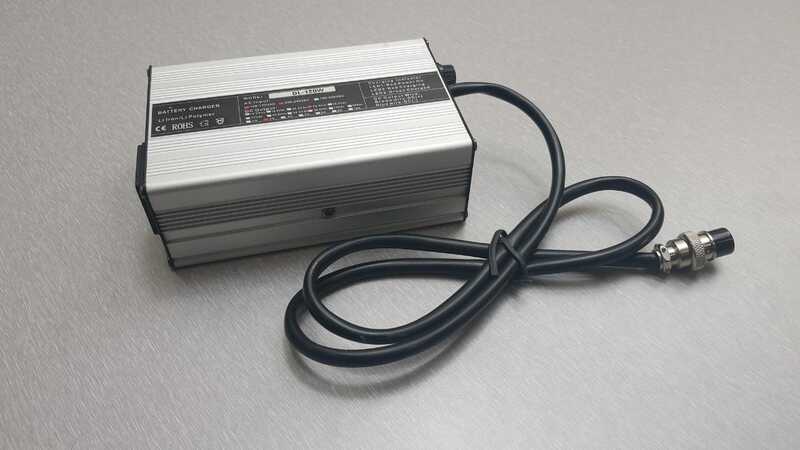 It is a Li-ion battery pack with balanced charging capability. Its operating voltage of 24V with a capacity of 7500mAh. Maximum current output from battery is 60A. It is placed at underside of robot at middle. Battery is connected to robot with 30A fuse limiting for safety. To keep hassle free in maintaining multiple batteries for extended usage huge capacity battery has been chosen and its standard run time over plane surface is up to 4 hours. It can be charged by connecting charger at back port of rear control panel. No need to remove battery. It is completely embedded within robot and properly fused. It is wrapped with belt which is comfortable to remove and replace battery from robot. It is connected with XT60 pin which is easy to plug out and plug in.